Where did the 15-M movement go? One week before last year's regional elections, a disparate group of youthful activists launched a movement that captured the mood of a country that had become tired of the squabbling between the two main parties, as well as their apparent inability to do anything about Spain's worsening economic crisis. Lacking even a name, the movement was dubbed 15-M, after the date, May 15, on which they made their entrance on to the political stage by occupying Madrid's Puerta del Sol and setting up a camp there. A year later, the youth movement has transformed into what is arguably the most interesting political development in Spain since the death of General Francisco Franco in 1975. And what is most interesting is that the 15-M movement has steered clear of traditional politics, taking a grassroots approach to activism by offering practical solutions to the problems faced by the more than five million people unemployed in Spain. The movement has refused to set any political agendas, avoiding the labor unions and professional politicians. Instead it has coordinated online campaigns and targeted specific issues, such as banking and electoral reform. 15-M is about a bottom-up, networked approach, in direct contrast to the vertical power structures of the main parties that have dominated Spanish political life since 1978. Through thousands of individual meetings, it has created a nationwide network that could represent a serious challenge to this country's vested interests. The movement's strategy is based on assembling ad hoc citizen coalitions to help push back and challenge specific government actions; trying to figure out how to affect policy by exerting force on specific choke points in a system that badly needs reform. Politicians worried about inter-party politics, re-election or special interests can't see the importance of this. It's about using the power of the network to shake things up and find ways to make the political process more responsive to the needs of everyday citizens. So, for example, the movement has been actively engaged with foreclosure associations that advise homeowners across Spain. These days it is common in Spanish cities to see groups of enraged neighbors standing guard outside buildings to impede judges from notifying, and therefore evicting, debt-ridden property owners. Most of these actions pop up spontaneously after information is exchanged on Twitter and then coordinated through the use of hashtags. Typical of the all-encompassing approach of the 15-M movement are the myriad cooperatives set up around the country by a range of professionals looking to barter their services with other groups, as well as to sell them to the wider community. "We're not angry - we're filled with hope," says Israel, an unemployed computer programmer who belongs to a cooperative set up in the Madrid working class neighborhood of San Blas last July. "I was brought up to be competitive; but what really matters is sharing. I knew when I lost my job that the state wasn't going to solve my problems, and that I was going to have to take matters in hand with others like me," he says. Israel's cooperative is just one of the dozens that have emerged thanks to 15-M in Madrid alone; another in the Aluche district has set up a food bank, collecting donations from stores and restaurants. Other areas have set up links with villages close to Madrid where they are now growing their own food, and throughout the capital, neighborhood associations have set up weekly swap markets. 15-M has also rallied together to offer support to migrants without paperwork in Spain. In Madrid's Lavapiés neighborhood earlier this year, hundreds of people blocked a street to prevent a police unit from arresting several people with the aim of deporting them. Turning their backs on the banking system, people have begun setting up their own credit unions and micro-financing initiatives. "This will be the year of the cooperatives," says Arturo de Bonis of the San Blas cooperative, who believes that the labor unions can no longer defend workers' interests in a world controlled by big business and driven only by profits. "We have to organize ourselves; it is the only way forward," says the 55-year-old economist, once employed by the World Bank, who joined the movement in the first days after the original occupation of the Puerta del Sol in Madrid, helping it set out an economic program. "Business owners no longer have a stake in their companies; they are simply a way to generate profits, and they will do whatever they need to do to maintain profits, even if that means selling the land their factories are built on. The business world is controlled by finance; there is no point any more even being a shareholder, it is all about moving money around: 15-M has to find a way to offer people an alternative." De Bonis says that since October of last year, 15-M has changed from simply being a protest movement to being one that offers solutions. "Unemployment is a huge problem, but it is also an opportunity: we can create an alternative and parallel economy. The quarter of the workforce that is unemployed can help us to achieve this," he says. De Bonis has been working over the last year with others in 15-M to design the so-called Synergies Cooperative, which has set up a network of local, alternative economies in neighborhoods like San Blas throughout Spain. Reflecting a growing perception that the labor unions are standing by doing nothing while the government presses ahead with labor market reforms that make it easier for businesses to sack employees, on May 1, 15-M set up an initiative to protect the interests of people who are having to work on short-term contracts, grants, bogus training schemes or on a self-employed basis to save their employers from having to pay their social security. The idea is to encourage more people to work together through cooperatives, as well as to use social networks and other media to report companies that are taking advantage of high unemployment to impose abusive working conditions. Arguably the most visible of 15-M's myriad activities over the last year has been its campaign to stop banks evicting people unable to pay their mortgages. This has been led by the Plataforma de Afectados por la Hipoteca (PAH), a nationwide network set up in 2010 to draw attention to the plight of people who had lost their jobs and, unable to meet their mortgage repayments, now face the loss of their home, as well as a legal requirement to pay back the bank loan they used to buy it in the first place. Under Spanish law, simply turning over your property to the bank does not cancel the debt. Close to half a million families and individuals have lost their homes through mortgage foreclosures in the present crisis. In reality, the PAH has been able to prevent only a tiny proportion of evictions and foreclosures going ahead - around 250. The PAH now works closely with 15-M, which has greatly increased its effectiveness. "In the early days we had to hire buses to move people around," says Ada Colau of the PAH. "But once 15-M got involved, things changed very quickly. Working within the 15-M movement has created a network." By concentrating on creating neighborhood groups, 15-M says it has become much more effective at preventing evictions and, where that is not possible, at finding alternative accommodation, often by squatting in empty properties. "The neighborhoods themselves organize their own anti-eviction groups," says Lidia, a Madrid-based activist barely in her 20s. "The PAH provides the lawyers; and our groups arrange for accommodation in our areas," she adds. Lidia helped set up a housing office within 15-M that brings together people who have lost their homes and helps them find somewhere to live. She says one of the main achievements of 15-M has been to raise awareness about homelessness and successfully defend the occupation of empty buildings. "Until now, squatting was seen as wrong by many people. But there is a growing understanding that while occupying a building or an apartment may not be right, there are situations when it makes sense," she says. Violeta, aged 60, who also works in the housing office, adds: "Occupying empty properties has become widely accepted. People see it as a basic right." She also says that the 15-M movement has increasingly attracted older people like herself, which has helped calm many potentially violent situations. "When the police come up against a wall of older ladies, like me, they take a very different approach than they would if they were facing a group of lads with dreadlocks." Sociologist Miguel Martínez, who has spent many years researching social movements in Spain, says that the 15-M movement has revitalized the country's neighborhood associations: "We are starting to see similar structures to those that emerged in the late 1970s, after Franco died." He also points to the impact that it has had on mainstream politics. 15-M has not only blocked evictions but also successfully lobbied Congress to debate protective measures for mortgage holders, such as legal reforms to approve dación en pago - walking away from a mortgage by handing back the keys and the property in exchange for the bank discharging all mortgage debt. That said, the proposal was rejected by all of the major parties. But the protestors have managed to get some banks, such as Bankinter, to accept the solution to all mortgage loans, while Banco Santander has offered a three-year mortgage payment suspension for clients who have lost their jobs or families who have seen a 25-percent drop in monthly income. "Of course the movement has achieved some things," says Jaime Ferri of Madrid's Complutense University political science department. "The most significant of which is that there is a new collective awareness of the importance of the fact that a large part of the population is demonstrating its discontent and taking action." Occupying empty properties is now accepted. People see it as a right"
Víctor Sampedro, who holds the Juan Carlos University chair in public opinion, describes the impact of the 15-M movement on Spanish politics as "astonishing," saying it has not only raised debate about walk-away mortgages, but also awareness of the role that banks played in inflating property prices. He points to the government's recent decision to introduce greater transparency into public life, along with widespread public protests against education and health cuts and attempts by the regional government in Madrid to privatize the publicly owned water company. "We are seeing a widespread questioning of the way that this crisis is being handled by our social democratic and conservative parties: new voices, new ideas," he says. "The pacts of silence that were agreed during the first years after Franco died have finally been broken. The problem is that our political class is still looking at events in the second decade of the 21st century through a mid-twentieth-century prism." Another victory by 15-M was to prompt a debate on the need to reform the country's election laws - which favor the large political parties - in order to increase social participation in decision-making. Members of the conservative Popular Party, such as Madrid regional premier Esperanza Aguirre, are now defending the use of open lists of candidates, while the Socialist Party has proposed reforms inspired by the German system, with a more proportional distribution of seats. 15-M has barely started. It is not interested in power, but in redefining the way that Spain's political parties operate, and principally in making them much more accountable. For example, it has organized a citizens' audit of the country's debt, aimed at clarifying where responsibility lies. It is also about to announce a popular tribunal that will offer the electorate a chance to judge the decisions being made by our leaders. The longer-term goal of the initiative is to have any evidence it collects eventually recognized in law, and that could be presented as part of a case brought against a government for negligence in its mishandling of the economy. "We are in the middle of a new phase of democratic evolution, in which society is much more politicized, but not under the direction of the political parties," says sociologist Miguel Martínez. "15-M is a success story: it has managed to retain its solidarity-based approach, it is open and transparent, and the minutes of every meeting are on the internet." This Saturday will see marches throughout Spain as part of a series of events to mark 15-M's first anniversary. The organizers are determined to see them pass off peacefully, but say they are worried at how the marches will be policed. "The police already have their lists of names and photographs of our activists - for example, people who have either prevented the arrest of migrants, or filmed such arrests," says Juan López, who took part in last year's two-month occupation of the Puerta del Sol. He says there will be no attempt to retake the square this year, and that all those taking part in marches have been told to take every measure to keep the events peaceful. Last week it emerged that a police unit normally assigned to monitoring terrorist groups has been given instructions to put some of the higher-profile 15-M leaders under surveillance. 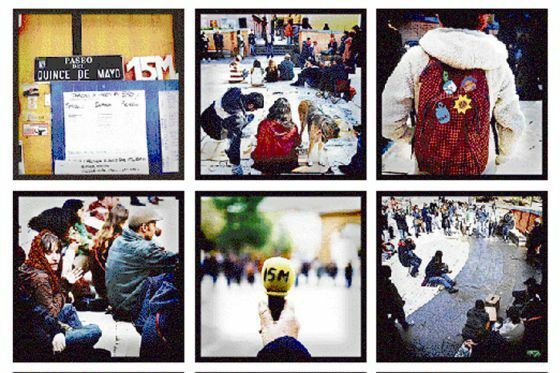 "Putting these kinds of stories about is clearly an attempt to use the media to create a climate of fear," says Aitor, who belongs to the Real Democracy Now (DRY) organization, which spawned the 15-M movement. "They want to convert what we are doing into a public order issue." He blames the Popular Party administration at the central and regional level of trying to prevent people from using public spaces to protest. Víctor Sampedro is also concerned about the PP's response. "They are clearly trying to categorize 15-M as a radical movement that wants to overthrow the system." As the 15-M movement approaches its first year of existence, the question is how to keep its momentum going. Will it face the same problems as DRY, which has been plagued by internal disagreements for months now? Last month, two of its founders, Fabio Gándara and Pablo Gallego, decided to formally register DRY as an association, prompting a storm of protests on social networking sites such as Twitter. Gándara has been arguing for some time for the need to change the group's structure, in an effort, among other things, to speed up the decision-making process at assemblies, where members have demanded full consensus before taking a decision. The other faction, however, says that DRY would lose a lot of its broad representation if it were to change its status from a loose grassroots group to a fully registered organization. While some in DRY are looking at making the group more operational, others want to study ways to improve its internal methods to attract greater participation. Of DRY's 29 constituent groups, only two support the pair's initiative, say critics of the move. Faced with coordinated and widespread opposition to the idea of DRY becoming something akin to, or that could develop into, a political party, Gándara says he will support it - but not as its leader.